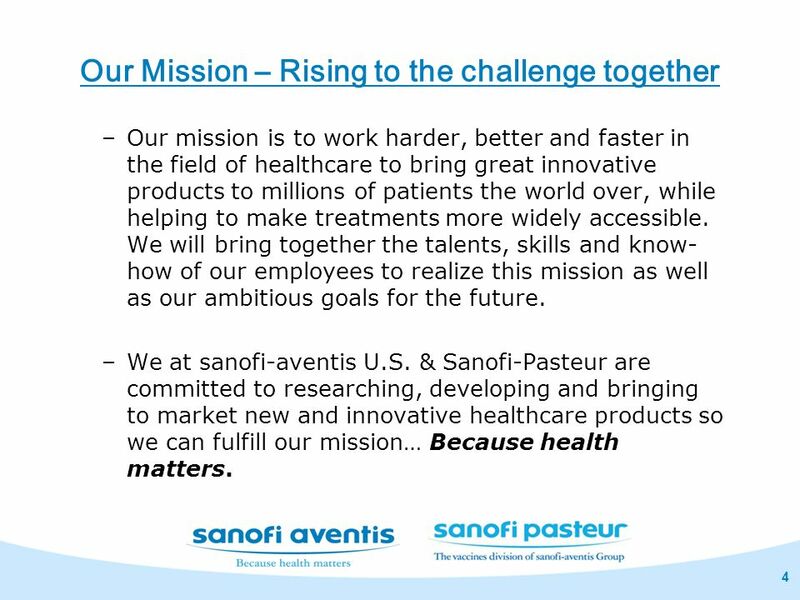 Our mission is to work harder, better and faster in the field of healthcare to bring great innovative products to millions of patients the world over, while helping to make treatments more widely accessible. 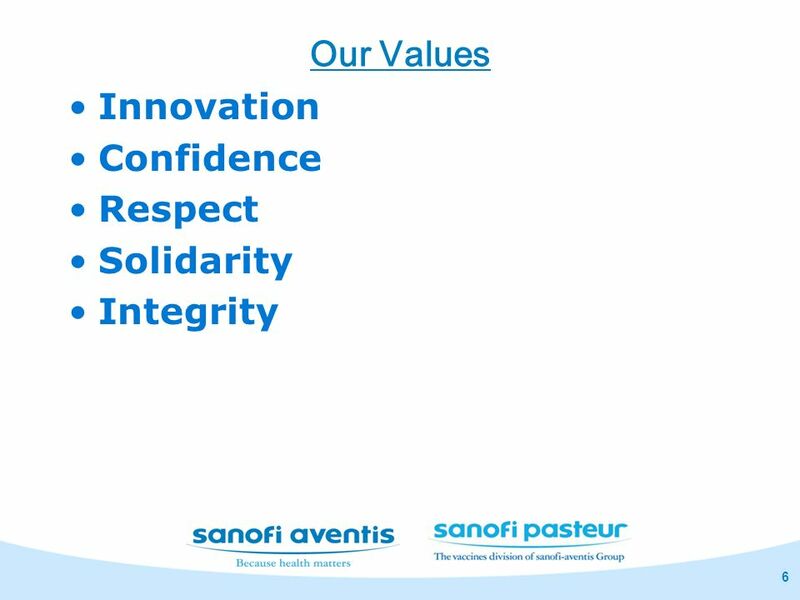 We will bring together the talents, skills and know-how of our employees to realize this mission as well as our ambitious goals for the future. 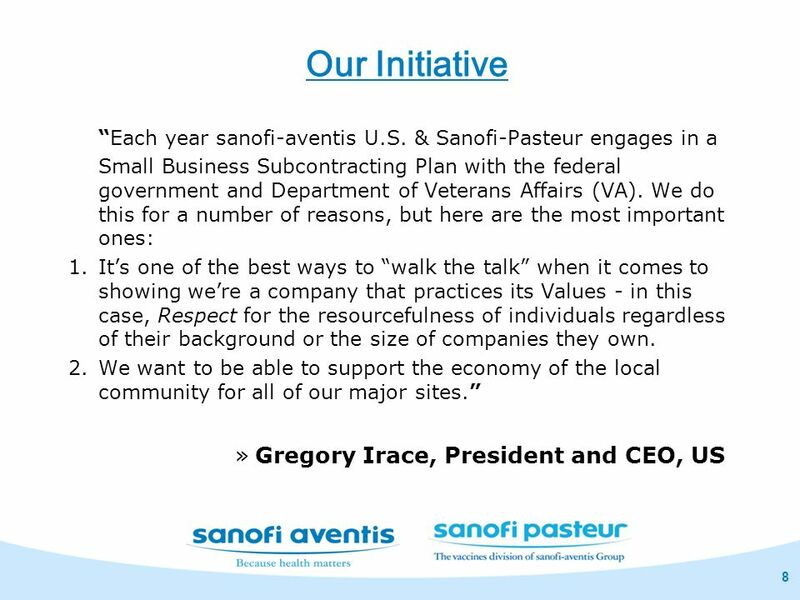 We at sanofi-aventis U.S. & Sanofi-Pasteur are committed to researching, developing and bringing to market new and innovative healthcare products so we can fulfill our mission… Because health matters. 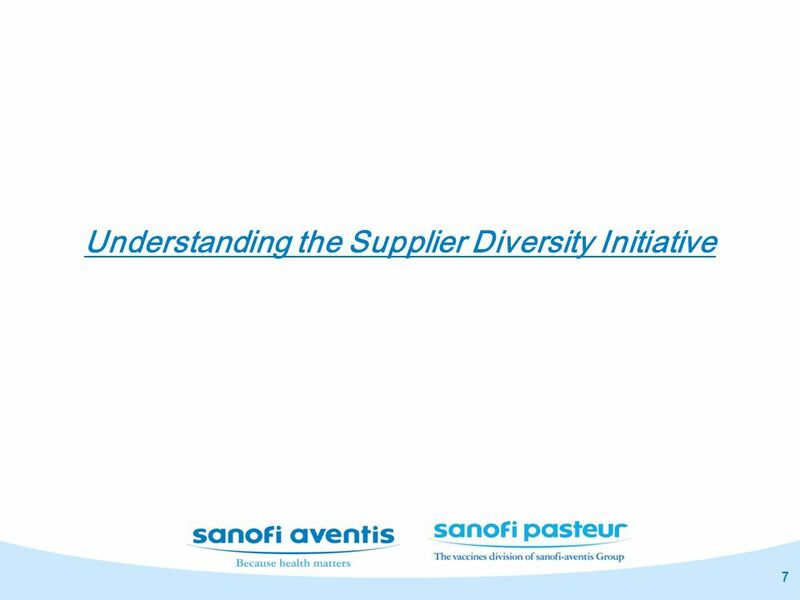 9 Our Commitment To facilitate all the activities of supplier diversity for sanofi-aventis U.S. & Sanofi-Pasteur. 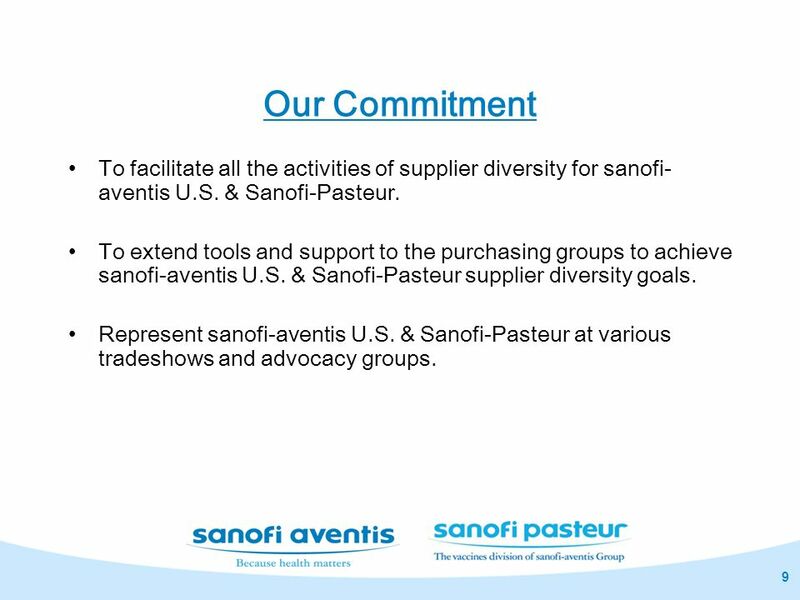 To extend tools and support to the purchasing groups to achieve sanofi-aventis U.S. & Sanofi-Pasteur supplier diversity goals. 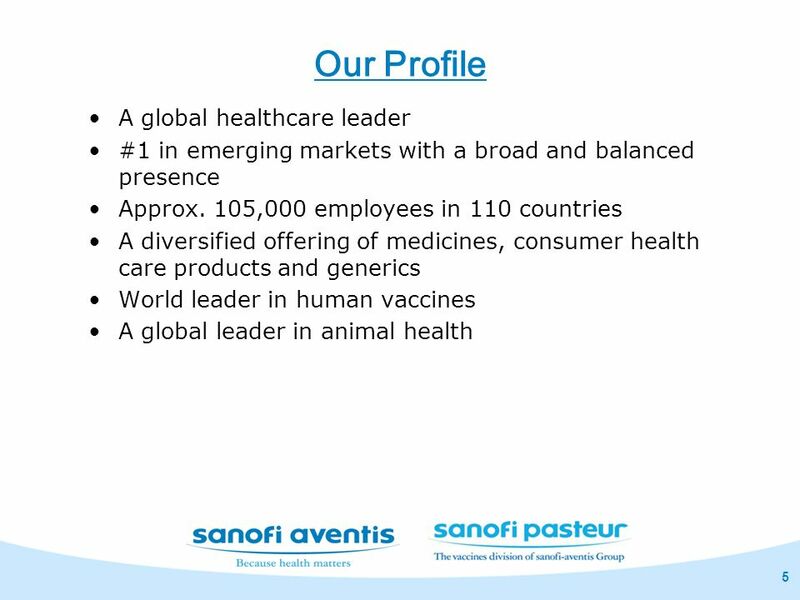 Represent sanofi-aventis U.S. & Sanofi-Pasteur at various tradeshows and advocacy groups. 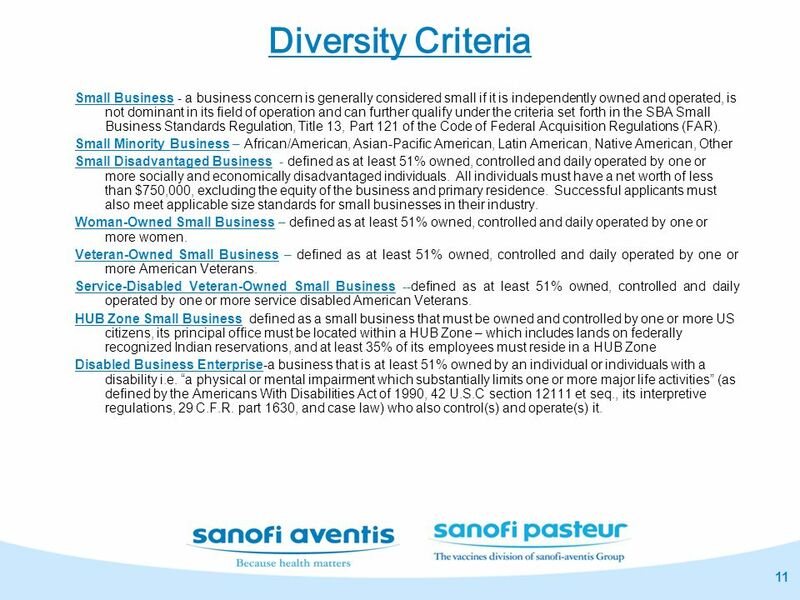 11 Diversity Criteria Small Business - a business concern is generally considered small if it is independently owned and operated, is not dominant in its field of operation and can further qualify under the criteria set forth in the SBA Small Business Standards Regulation, Title 13, Part 121 of the Code of Federal Acquisition Regulations (FAR). Small Minority Business – African/American, Asian-Pacific American, Latin American, Native American, Other Small Disadvantaged Business - defined as at least 51% owned, controlled and daily operated by one or more socially and economically disadvantaged individuals. All individuals must have a net worth of less than $750,000, excluding the equity of the business and primary residence. Successful applicants must also meet applicable size standards for small businesses in their industry. Woman-Owned Small Business – defined as at least 51% owned, controlled and daily operated by one or more women. Veteran-Owned Small Business – defined as at least 51% owned, controlled and daily operated by one or more American Veterans. Service-Disabled Veteran-Owned Small Business --defined as at least 51% owned, controlled and daily operated by one or more service disabled American Veterans. HUB Zone Small Business defined as a small business that must be owned and controlled by one or more US citizens, its principal office must be located within a HUB Zone – which includes lands on federally recognized Indian reservations, and at least 35% of its employees must reside in a HUB Zone Disabled Business Enterprise-a business that is at least 51% owned by an individual or individuals with a disability i.e. “a physical or mental impairment which substantially limits one or more major life activities” (as defined by the Americans With Disabilities Act of 1990, 42 U.S.C section et seq., its interpretive regulations, 29 C.F.R. part 1630, and case law) who also control(s) and operate(s) it. We highly recommend that all our current and prospective suppliers register on our website by visiting This database holds a profile of our current as well as prospective small and diverse suppliers while giving us access to SBA’s resources on the Central Contractor Registry (CCR). 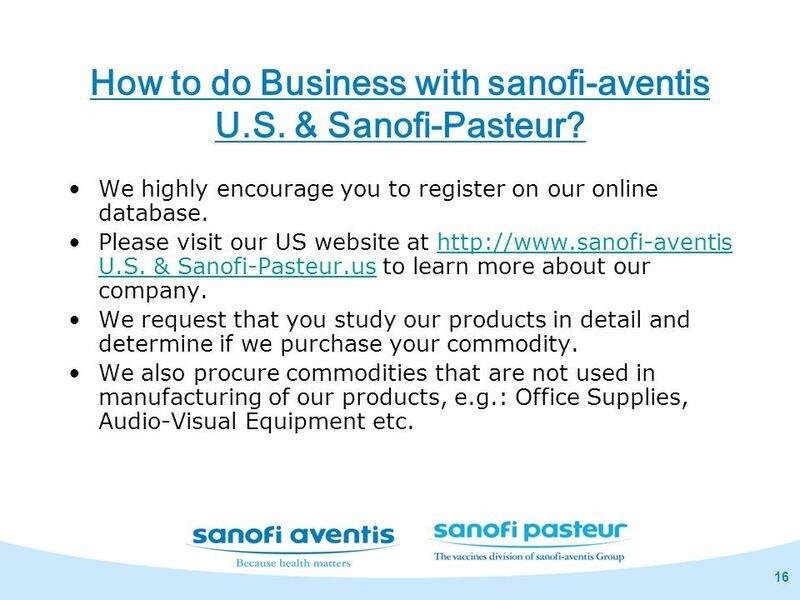 sanofi-aventis U.S. & Sanofi-Pasteur buyers access this database to search for new suppliers while bidding out new and old projects. 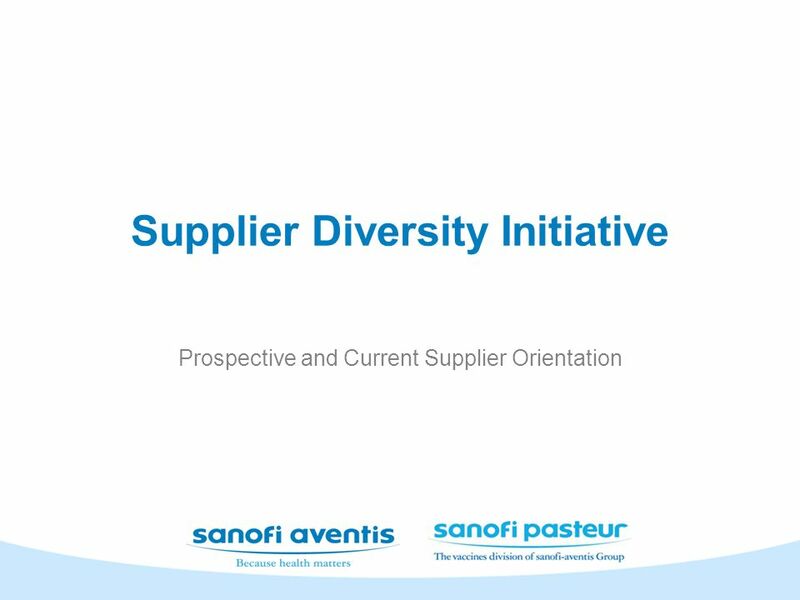 The sanofi-aventis U.S. & Sanofi-Pasteur U.S. diversity portal gives access to this database and everyone in the company who is involved in sourcing activities are encouraged to use this tool. 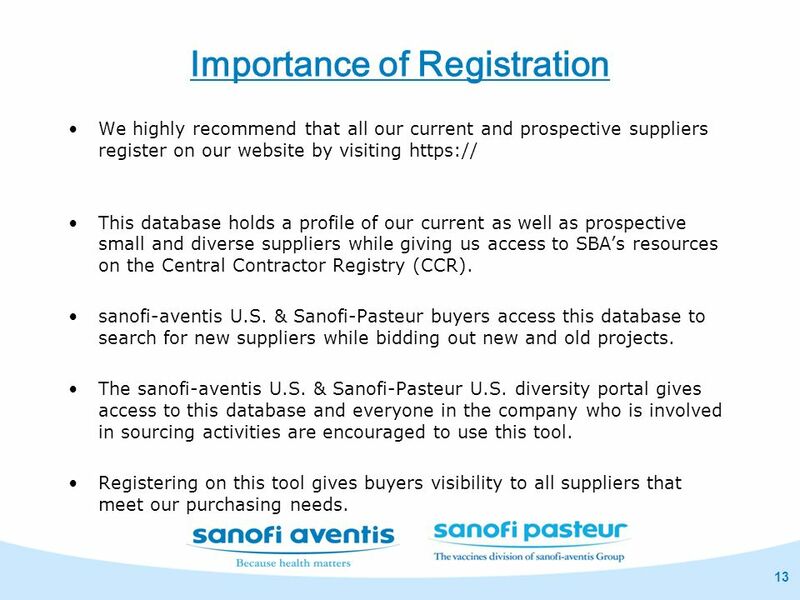 Registering on this tool gives buyers visibility to all suppliers that meet our purchasing needs. 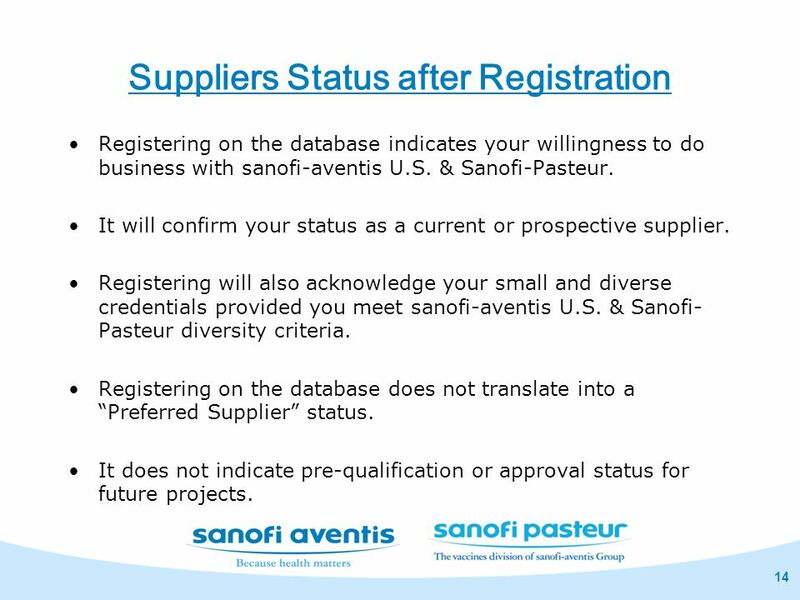 Registering on the database indicates your willingness to do business with sanofi-aventis U.S. & Sanofi-Pasteur. It will confirm your status as a current or prospective supplier. 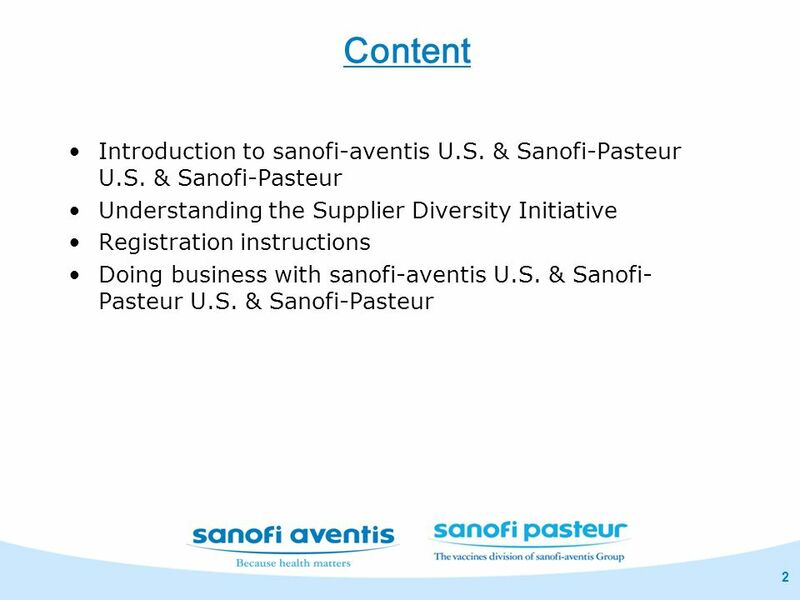 Registering will also acknowledge your small and diverse credentials provided you meet sanofi-aventis U.S. & Sanofi-Pasteur diversity criteria. Registering on the database does not translate into a “Preferred Supplier” status. It does not indicate pre-qualification or approval status for future projects. 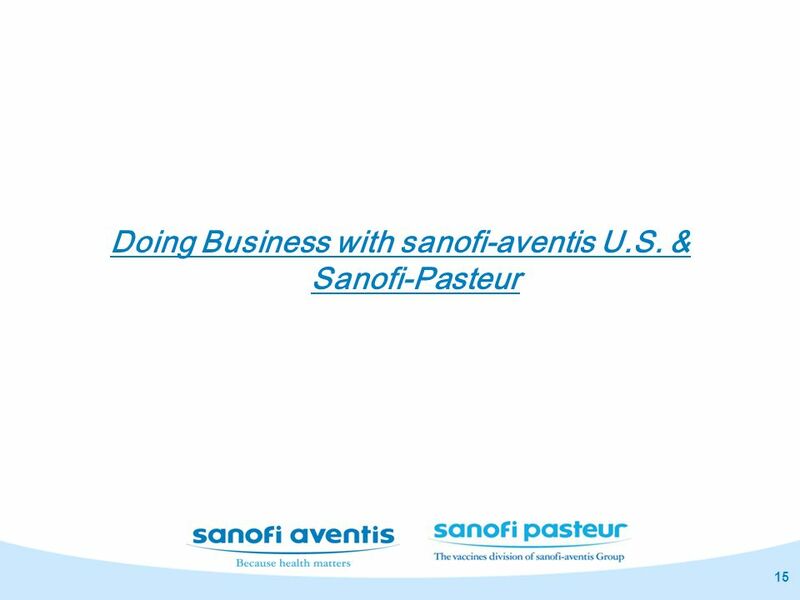 16 How to do Business with sanofi-aventis U.S. & Sanofi-Pasteur? 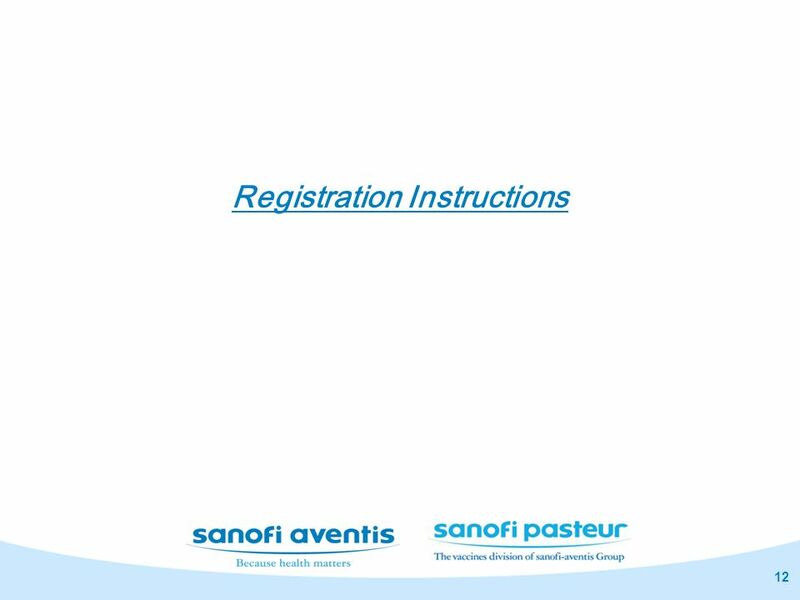 We highly encourage you to register on our online database. 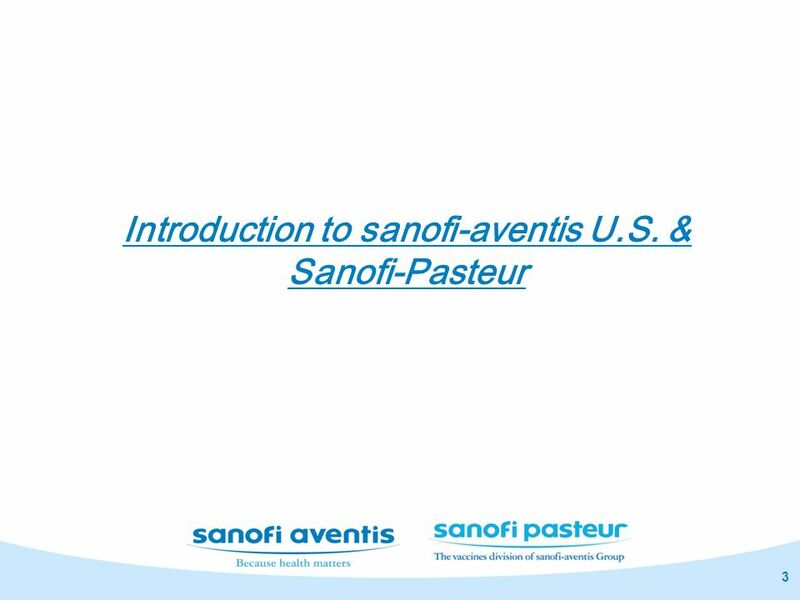 Please visit our US website at U.S. & Sanofi-Pasteur.us to learn more about our company. We request that you study our products in detail and determine if we purchase your commodity. We also procure commodities that are not used in manufacturing of our products, e.g. : Office Supplies, Audio-Visual Equipment etc. 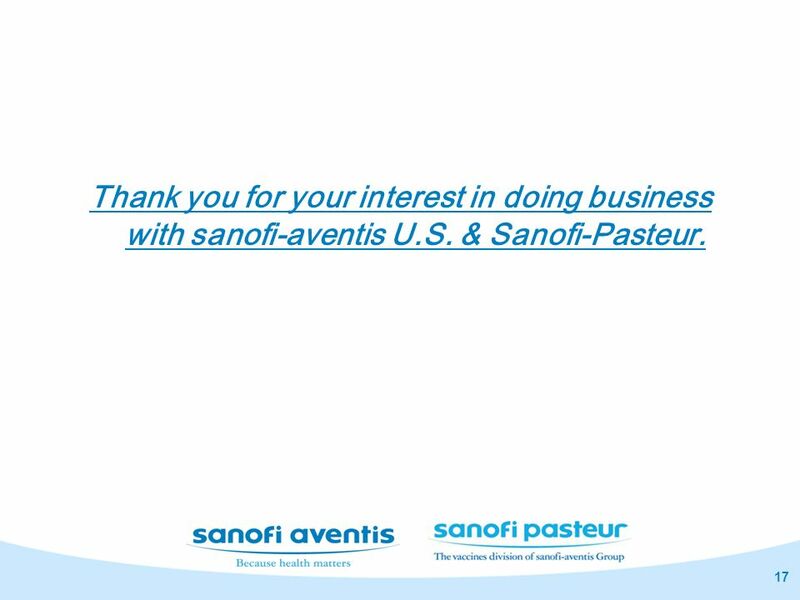 Thank you for your interest in doing business with sanofi-aventis U.S. & Sanofi-Pasteur. 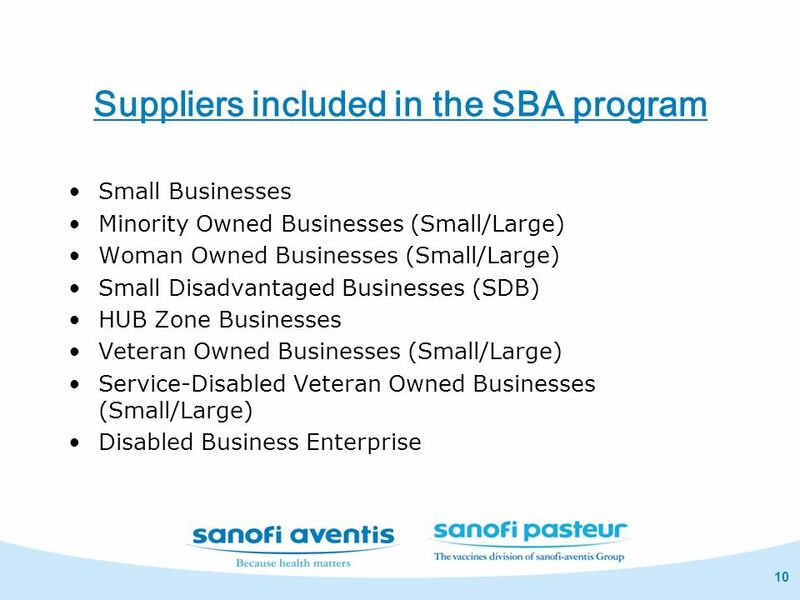 Download ppt "Supplier Diversity Initiative"
Office of Government Contracting & Business Development -- HUBZone Program -- February 2012 The HUBZone Primer Eligibility & Certification Requirements. 1 Florida Gulf Coast University Small Business Development Center (SBDC) Procurement Technical Assistance Center (PTAC) Introduction. 1 Contracting by AFOPO ess. Doing Business with Texas Tech Jennifer Adling Director of Procurement Services November 13, 2013. 1.  Overview of the WOSB program  Eligibility requirements  Certification and Repository  Resources and Q&A 2. Office of Purchasing and Contracts Procurement Outreach Training Level II - Module B Special Purchasing Methods. Office of Purchasing and Contracts Procurement Outreach Training Level II – Orders Up To $50,000 Module B - Special Purchasing Methods. The Small Business Administration n Established in 1953 n Government funded organization that helps small businesses to get started and to. Statewide Historically Underutilized Business (HUB) Program Texas Comptroller of Public Accounts HUB Assistance Lab Presented by Keisha Gash HUB Marketing. Key Partnerships: UMKC Bloch School Of Business UMR - Center for Outreach and Entrepreneurship MU College of Engineering. Alliance Mid-Atlantic1 Back to Basics Presented by: Sherry Rose NJ Institute of Technology, PTAC & M. Clyde Stoltzfus SE PA PTAC University of Pennsylvania. FEDERAL CERTIFICATION PROGRAMS MWBE CENTRAL INDIANA RESOURCE FAIR INDIANAPOLIS, IN 17 JULY 2012 Presented by : Lynda Parrett, CMR Kathy Ragland, PCR Government.